The aim of the day was to build relationships between CPFs, SAPS and the community. 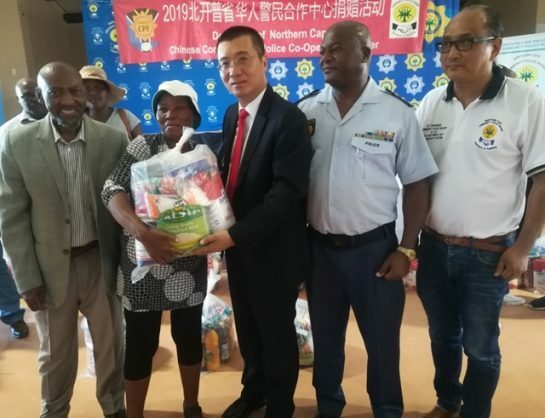 The Chinese community police forum (CPF), the provincial CPF board and South African Police Services (SAPS) handed out food parcels in Homevale, Kimberley, on Monday. “The Chinese consulate general of the Peoples’ Republic in Cape Town, Lin Jing, accompanied by the Northern Cape SAPS deputy provincial commissioner, Major-General Phiwe Mnguni and mayor of the Sol Plaatje municipality, Patrick Mabilo, handed out one hundred food parcels to identified needy families from Kimberley, Galeshewe, Roodepan, Kagisho and Modderrivier,” SAPS spokesperson Captain Sergio Kock said.